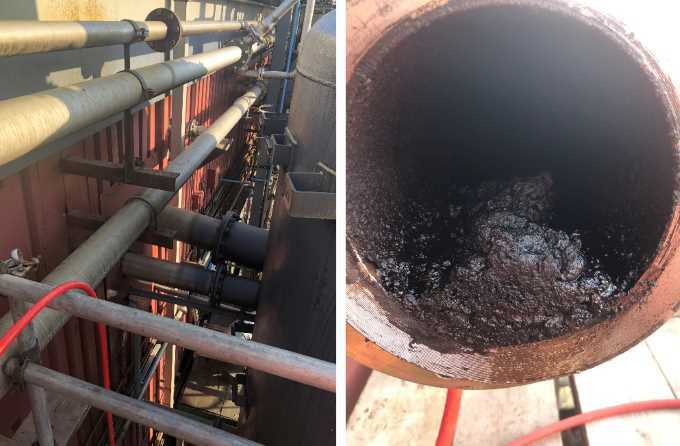 Hydroblast were tasked at short notice this weekend with the unblocking and cleaning of an evaporator pipe over 40m long for a well-known polymer and resin manufacturer. The blockage was a significant problem for the company, with it they could not continue production, and time restraints meant it had to be left in situ. The pipe had not been cleaned properly in the last 3 years, other companies had been in and failed, but not Hydroblast. The unblockage of the waste resins and chemicals was achieved using one of our latest UHP pumps, capable of pressures up to 3000 bar. On this job, one of our wide variety rotary nozzles was used at 2500 bar, 24 litres per minute. The ultra high pressure pump is driven by the latest Volvo tier four final engine, which had a very impressive fuel consumption of 24 l/h. This is significantly less than other pumps available on the market, keeping running costs down with reduced emissions with the aid of its on board AdBlue. The machine is also very quiet as it is designed to run in a sound dampened box, meaning db levels are lower than other jetting pumps. All this aids in the companies ISO 14001 Environmental standards. Safety is always our top priority, and is part of the companies OHSAS 18001 operating procedures. Automated equipment was not possible on this occasion so the pipes were jetted manually. As part of our methodology and being members of the water jetting association, back out prevention was used to protect the operator. Also, all operators are provided with their own TST suit or Turtle Skin Kevlar clothing and is worn as part of best practice PPE. The pump operator watches closely and can shut the machine down using the remote control cable in the event of an emergency. 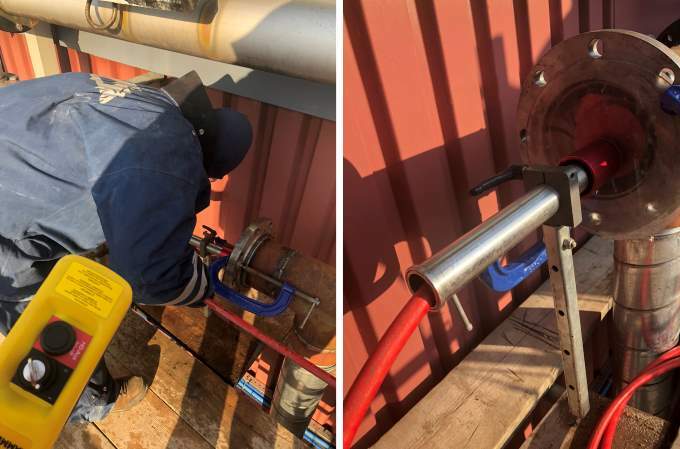 Additional safety features included a t-piece connected to the pipe to allow waste water and debris to filter into waste containment on the ground floor to prevent the operator coming into direct contact with the product being jetted out. Our quick response using water jetting technology, innovative thinking and knowledge meant that we were able to complete the job in just one day. We continued jetting until clean water ran freely from the pipe. The client was so impressed with our expertise and speed, it meant they could get back into production quicker than expected. 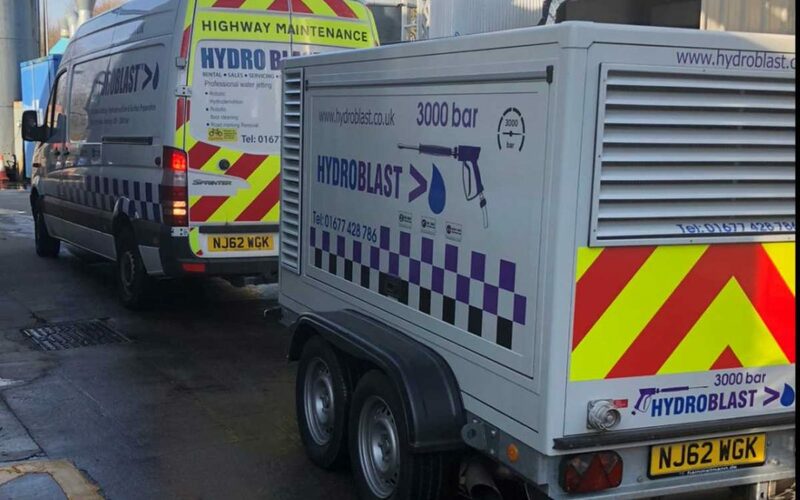 They realise what value Hydroblast can offer and have asked to return for other industrial pipe cleaning, heat exchangers and tank cleaning requirements they have. If you would like more information and to use our expertise and specialist equipment, please contact us.